In this issue of our newsletter you will read more about the organizations we liaise with, be updated on our children and see some of the photos of them outside the parameters of the home. We also tell you more about our new manager, new staff and introduce you to our staff and members of the board. 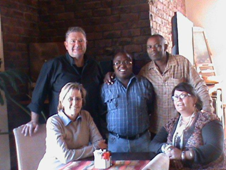 Since January 2011, 5 children were reunited with their families and 9 children are pending foster care finalisation. All the children that are placed on a long term section 35 (1) (a) / (b) are doing well under the care of their potential foster parents. 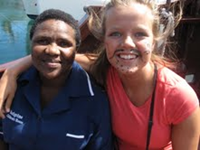 One of our older boys left Masigcine in arrangement with his psychologist and has moved to SA Children's Home. He has been reported to be adjusting well to the environment at the school and the new home. In March, one of our babies left the home on a closed adoption. 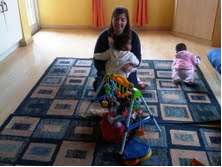 One of our children with cerebral palsy was regularly being hosted by a very caring family. With the individual attention, love, care and support of this family he made good progress. They took him to his doctor's appointments and to see specialists for assessments in order for him to get transferred into the best care facility according to his needs. He has now been moved to a specialised care facility on a probation period of three months. Our social worker and the family visited him and are happy to report that he is thriving! It has been a very sad period for us, as four of our children, (2 sets of twins) lost their mother's this term. Although they do not realise the full impact of this, our staff are very supportive and caring. 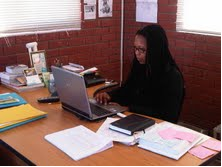 Sydene, originates from Namaqualand and started off her career as a ECD teacher. After which she continued in the ECD field as a teaching Principal/administrator at a private company school in Kleinzee where she grew up. She then relocated to Pretoria where she was principal at UCECE (UNISA Centre for Early Childhood Education) for the past two years. She was involved in the NICRO program (National institute for Crime prevention and the reintegration of offenders) and provided guidance and counselling to troubled high-/primary school children and their parents. 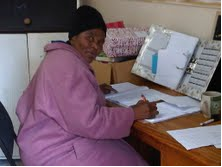 She continued guidance and counselling at children's homes/places of safety, through a church organisation, Kids for Christ in Pretoria. Sydene worked out a structured educational daily program, addressing the holistic development of the young child. The new program was introduced and worked through with the staff and is also introduced to all our volunteers. We are happy to announce that Monica Makoli, who has been with us some time, has been appointed as a permanent staff member. Monica and her husband Andile, are originally from Alice in the Eastern Cape. 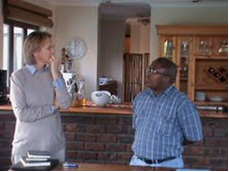 She worked with a family in King Williams Town for seven years and when they relocated to Cape Town, they were not willing to loose a trusted employee and friend, so she came to Cape Town with them in 2003. She was with the same family until 2010, when she started as a temp at Masigcine Children's home. 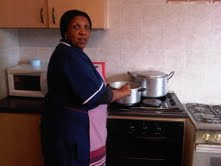 Monica and her husbands are now permanent residents of Mfuleni, where Masigcine Children's Home is located. Their twin daughters still reside with her mother in the Eastern Cape. Congratulations Monica! We know that you will continue to deliver work of a high quality! We want to congratulate our staff members who received awards for outstanding performance for the months January, February, March and April 2011. As you can see, most of our staff has been with Masigcine for several years, so our children grow up in a stable environment with people they know, love and trust. That is just what they need to make them feel safe and give them a sense of security. 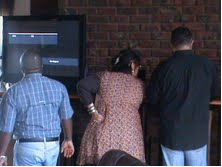 Xolile, Sydene and Michael are trying to figure out how to connect the laptop to the television. In the end we had to admit defeat and resort to the laptop. 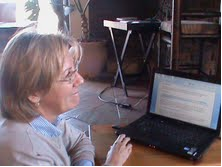 Hilda edited the documents as we went along. We had students from YALE visiting Masigcine for the first week in March. We are still working together with AVIVA, who provides most of our volunteers. 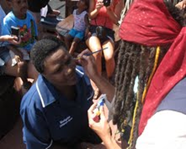 AVIVA - (Volunteering in South Africa ) offers international volunteers the opportunity to make a vital contribution to Communities and Endangered Wildlife while enjoying a life changing, hands on volunteering experience in South Africa. We work together with AVIVA and they provide us with overseas volunteers. 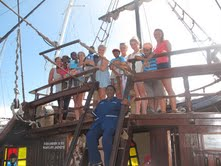 The AVIVA volunteers work three days shifts at Masigcine. When they are on shift, they sleep at the home in our volunteer's room. 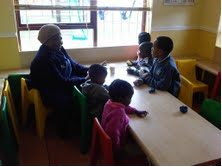 One of our AVIVA volunteers spending time with our little ones. This is especially rewarding for emotionally mature volunteers, who are able to see the positive difference their contribution has made to the lives of some very special young children. We work together with ARISE to find suitable host and foster parents and match them with our children. Arise conduct the initial phase of the host parent programme. This involves host parent recruitment, information giving, assessment and screening of hosts, and connecting them to Masigcine Children's Home. As organisations dedicated to caring for children, both Masigcine Children's Home and Arise seek to encourage and facilitate people to offer the optimum care to a child that they can. We are partnering together to promote longer term 'Host Parenting' whereby an adult will develop a positive on-going relationship with a child, as opposed to one-off interactions with different children. Provide training for host parents once/twice a year (as needed) in partnership with Masigcine Children's Home staff. Hidden Halo's is a NPO that visits the home once a month, to have a birthday party for all the children who celebrated their birthday that specific month. They also brought the Easter bunny to the home and of course he dropped off some Easter eggs. 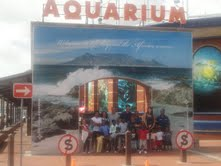 Needless to say, our kids loved the experience! 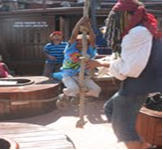 Our AVIVA volunteers took our children on a pirate boat trip. As you can see, they had a blast!!! 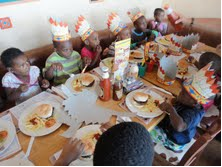 Community family church took our kiddies up Table Mountain the morning of 12 March and to the Spur for lunch. 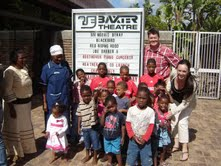 Community Family Church took them to a production at the Baxter theatre on Saturday 2 April 2011. Masigcine Children's Home, wants to give a special thank you to Shoprite, Mfuleni who thought of us, despite their misfortune. In February 2011 the Shoprite in Mfuleni burned down and they donated their disposable nappies, ear buds and some towels to us that were not damaged in the fire. We trust that they will be up and running again soon! Thank you to all the individuals and organizations that dropped of clothes/shoes/toys and books and did not always leave contact details. Our main goal and desire of course is to reunite our children with their families or to place them with a family who will adopt them as their own. To raise and get funds to furnish our home with at least one vehicle, to take our children to doctor appointments, to hospital, to court and on outings. We want to get more and more people involved to make a change in the lives of children in need. On behalf of the children, board members and staff at the Masigcine Children's Home we would like to convey our heartfelt thanks to each and everyone for your ongoing support and goodwill towards our home.